I want to be part of this Book Launch Team! Soulful Truth Telling: Why Isn’t this Marriage Enough? This book is for the woman who has everything she’s ever wanted: the nice husband, the healthy kids, the big home, even the career of her choosing. From anyone else’s perspective, her life looks enviable. Then why isn’t this enough? And how can she make it be enough? Even if this doesn’t describe you, your participation in this group will help get this book into the hands of the women that need it…..the women who even though everything looks perfect, cries herself to sleep at night. You will receive notification first – before anyone else in my community – when you can download the book off Amazon for FREE. 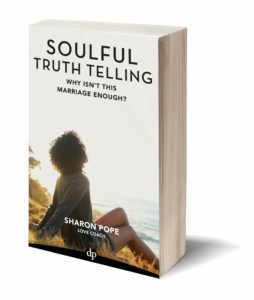 Additionally, if you post a review of the book on Amazon by 9/30/16, I will give you every book in the Soulful Truth Telling series as my gift to you. And you’re important to me. You are special to me because there is nothing that a writer loves more than to be read and you’ve all taken an active interest in my writing. You’re why I do what I do and I’m glad that it speaks to you. You are important to me because having a big launch within the first few days on Amazon makes an enormous difference to this book getting into the hands of those that need it most. Amazon looks at number of downloads, but they also look at the reviews posted about the book. So, I couldn’t do this without you. Hi, I’m Sharon. I am a certified Master Life Coach and an International Best-Selling Author of the Soulful Truth Telling series. As a woman that has experienced a divorce from a relationship that looked picture-perfect from the outside myself, I have found my way through that darkness and into the light that has always been there (and yes, I found a deep, soulful, and lasting love on the other side). What another like you has said…..
“I suppose starting with THANK YOU is appropriate. I got about half way through and I think I said out loud “Who in the hell wrote this?” Thus began my mad dash to find everything you had ever written. I, of course, purchased your book that day and read it front to back twice and just ordered the print version so I can highlight it to death. At times, I’ve questioned if I’ve read every self-help book on the market, from Melody Beattie to Brené Brown to Wayne Dyer to Caroline Myss; they are all on my bookshelf. When I read your book I felt as though you wrote it for me or you somehow know my therapist and y’all have been sharing my information. Although our stories are very different, they are oddly similar in the underlying issues. I have been living my last 32 years in fear and not trusting myself. I am so thankful for your work and my Inner Wisdom and to all of the things that make me never give up on myself.